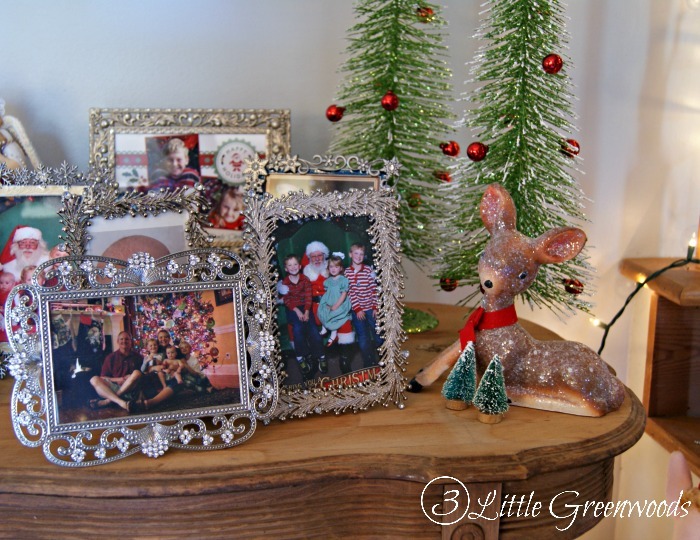 Today I’m sharing the story of my grandfather’s table and how I used Simple Winter Decorating Ideas to add a little sparkle to it after the holidays. 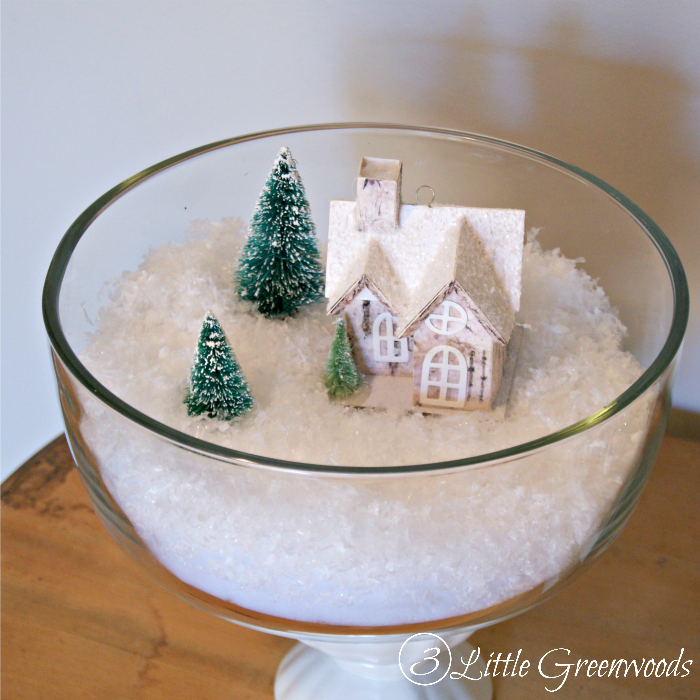 It’s simple winter decorating for your home after Christmas with a DIY snow globe and snowflake ornaments. My grandfather was a collector. He filled an old barn, a shed, and every nook and cranny he had with pieces and parts that he just knew would be valuable one day. Most of the things he collected wouldn’t be considered very important to most people but this small foyer table means the world to me. It was tucked into a corner of an outdoor porch at my grandparent’s house. This spindly beauty was covered in spider webs and dirt with water stains on the top. The finish was completed worn away. It was a piece of my grandfather that I could bring into my home. During Christmas it was covered with Santa pictures of our children. But once the holidays were over it looked bare and empty. That’s when I pulled out a few Christmas decorations out of the attic to share a few simple winter decorating ideas with you. You will notice that I ditched my favorite reds and greens to focus on a winter white theme for these simple winter decorating ideas. The large abstract painting that usually hangs in the foyer was replaced with a upcycled frame filled with Dollar Store snowflakes. 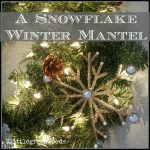 Two more snowflake ornaments were used to add sparkle to a stack of books and on the lamp. Love that little gnome! He was a clearance find at a local home improvement store. 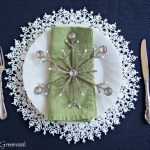 My favorite winter tablescape idea is the DIY snowglobe I created with a small floral vase and the top of a cake plate. More about that easy idea coming soon! Isn’t the little birch house adorable? 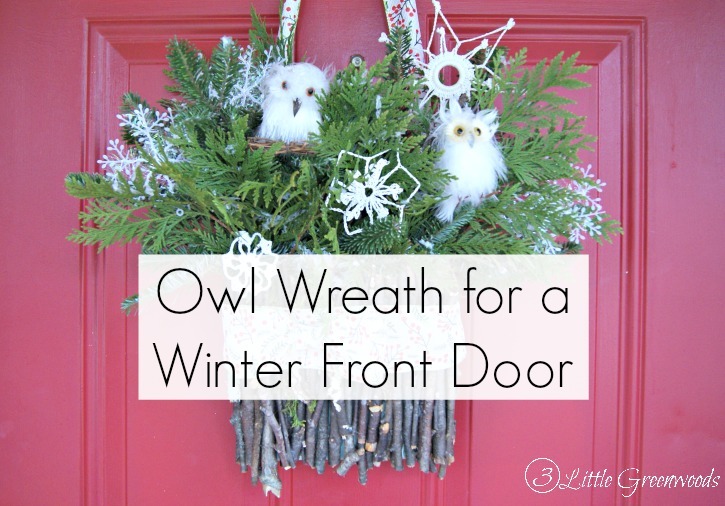 Right outside the foyer is the cutest winter wreath you’ve ever seen! 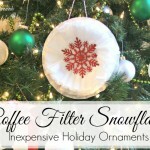 It’s filled with greenery, more Dollar Store snowflakes, and white fluffy owls. The winter decorating didn’t stop in the foyer. 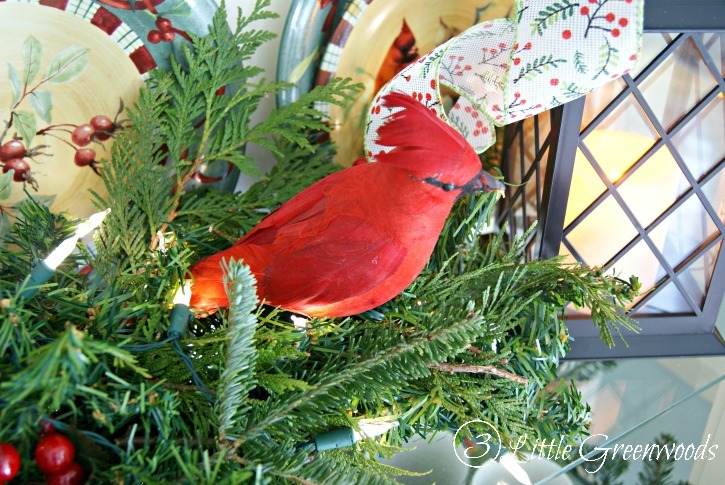 Our kitchen hutch also got filled up with my favorite holiday plates, greenery, and bright red cardinal. 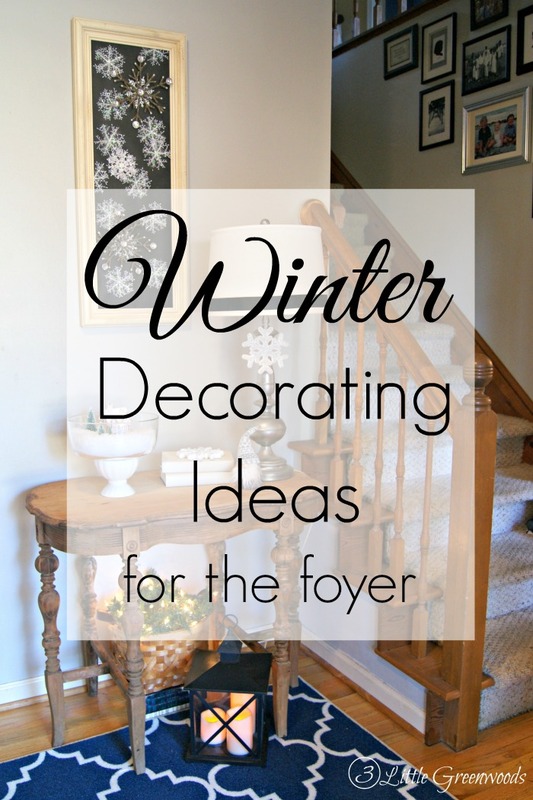 I’ve teamed up with a few of my favorite DIY Decorating Bloggers to bring you even more Simple Winter Decorating Ideas. 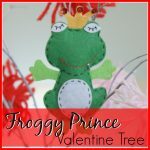 Take a few minutes to hop over to their blogs and be inspired! 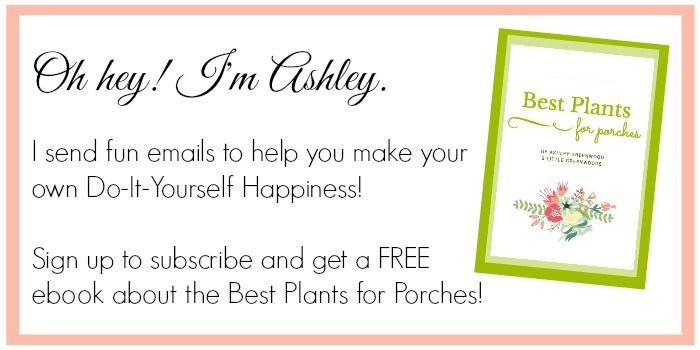 Ashley – your home is beautiful. We love all of the winter decor touches you added to your spaces. Your snowg lobe is winter perfection! Thanks so much for the tour! I love the table! What a precious piece you have! Your snow globe is perfect. I have several as well~ great minds think alike. Thanks so much for joining this tour! I saw those snow globes! 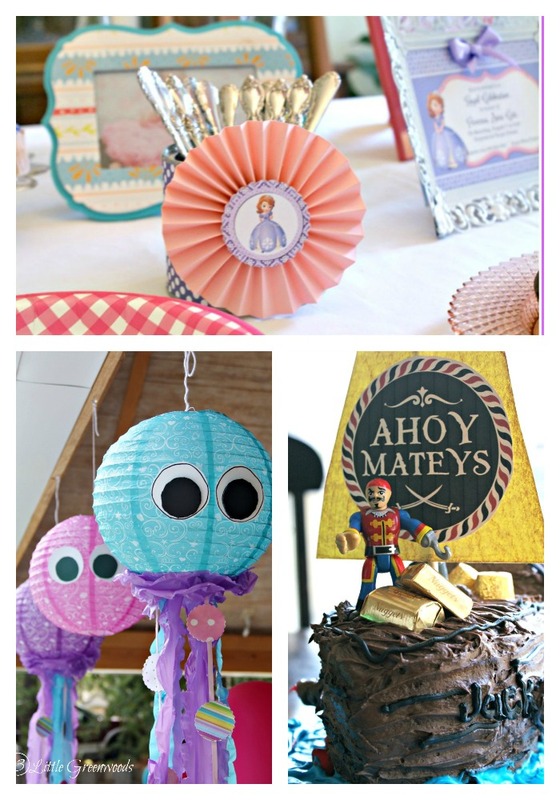 Love how you used them in your decorating!Thanks so much for your sweet comment! 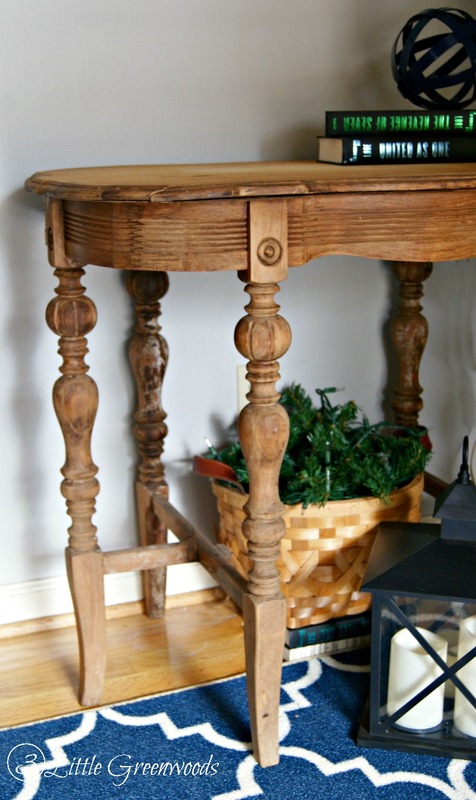 That foyer table from your grandfather is absolutely fantastic Ashley! 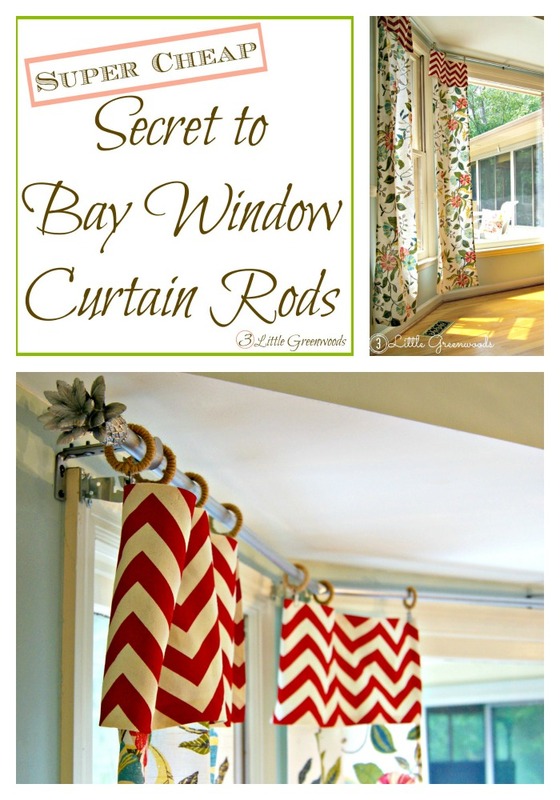 What a wonderful treasure to have every time you walk in your home. 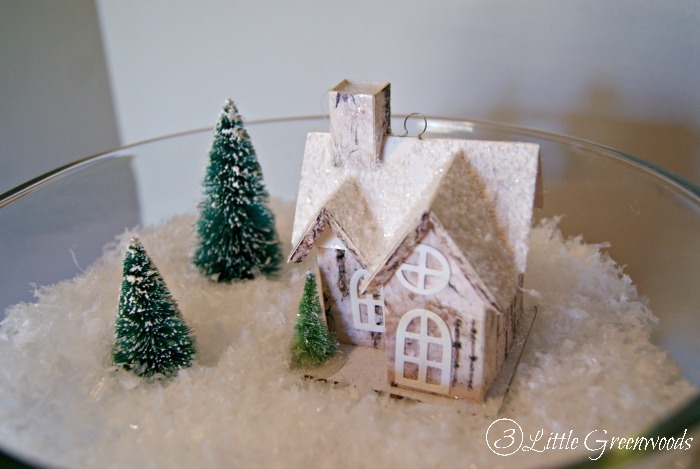 That little birch house you added to the glass bowl is really cute too :). I was so excited to receive my grandfather’s little table. Some might want to paint or restain it but I love it just the way it is. Thanks so much for your sweet comment! 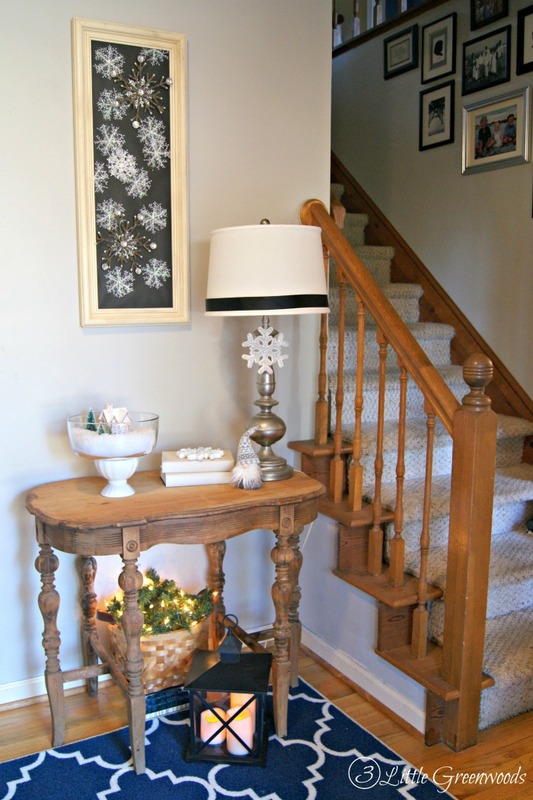 I love your beautiful foyer!! The owl wreath just makes me smile and I so want it!! I love those fuzzy little owls too! They totally pop against the greenery of the wreath. Thanks so much for your sweet comment! I love all the wintery crafts you have all throughout your home. 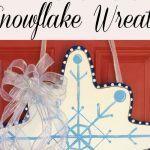 I want to make that large snowflake like the one you have in your post. I have this project going on now that I am making blue mini ones. Love that stick and owl craft for the front door. My favorite. 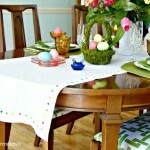 I just love that table! And your winter touches are perfect for this time of year! Thanks for the sweet comment, Angie. That is wonderful that you have a table your grandpa built and that you use it as a desk. 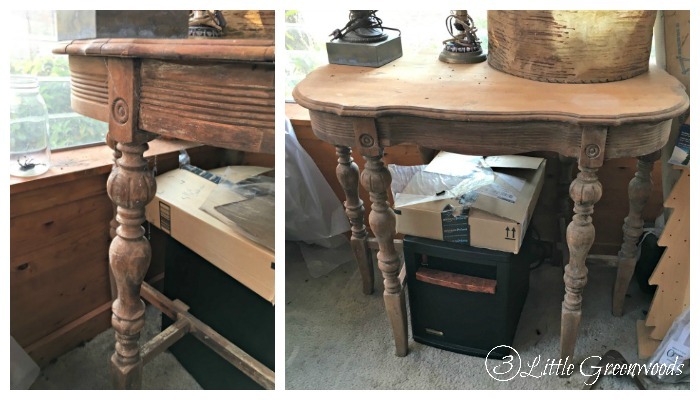 I love furniture and items that are family heirlooms and carry special memories – how wonderful to have this table from your grandparents! 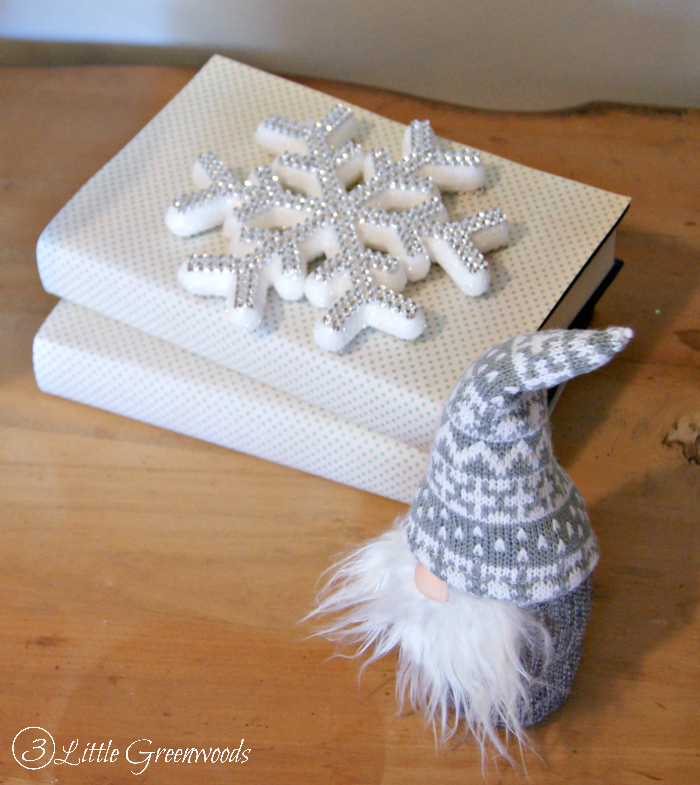 I love your winter touches throughout your home, especially that gnome! 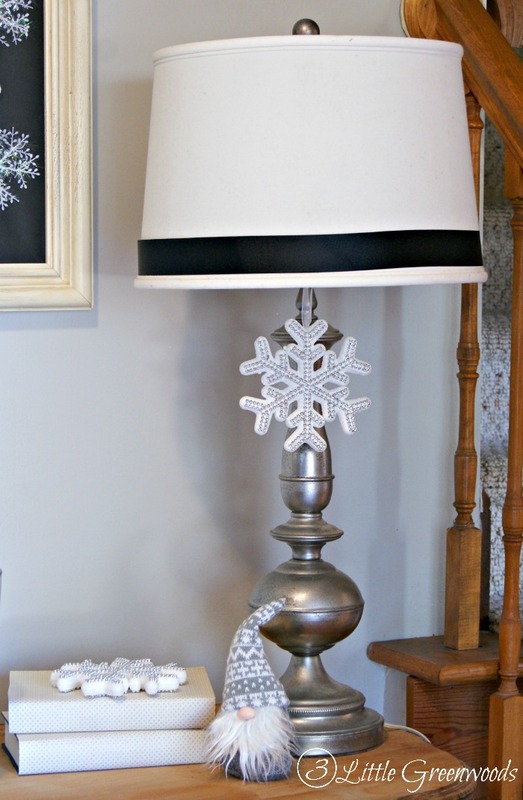 I love the lamp with the snowflake on it. Super cute!